There is a reason I don’t bake gluten free bread often. It’s because in the presence of a freshly baked loaf of bread I have very little self-control. I can’t stop eating it. But then I got a reader request for a gluten free bread recipe. Since I aim to please, here it is reader, you know who you are, the best and easiest gluten free bread recipe you will ever make! Making gluten free bread is no easy feat. Gluten gives bread its light, airy structure and enables it to hold together as it rises. Trying to mimic that is downright hard. Once you dive into the world of gluten free bread baking you will soon discover recipes with ingredients as long as a thesis! Ingredients such as whey protein powder, powdered milk, Ultratex 3, Expandex, xanthan gum, guar gum and many more. Making GOOD gluten free bread is challenging but not impossible. I have experimented A LOT throughout the years and have learned a few tricks which I will share with you in this post. Adding a high protein flour to your mix adds structure and flavor to the bread. I have used Organic Buckwheat Flour but feel free to experiment with other high protein flours like quinoa, sorghum, millet, amaranth, teff and gluten-free oat flour. Just beware that it will affect the taste. Sparkling water – contains carbon dioxide which helps the gluten free loaf rise and develop air bubbles. Organic Psyllium Husk Powder – is an excellent binder and really gives the bread that ‘bread like’ texture. Olive oil – adds moisture, a tender texture and extends shelf-life. This gluten free bread dough is more like a batter than a dough. You wont be able to knead it. Do not be tempted to add additional flour or it will result in a dry loaf. A scale – I highly recommend using a scale. You’ll get the best results. I have this one . 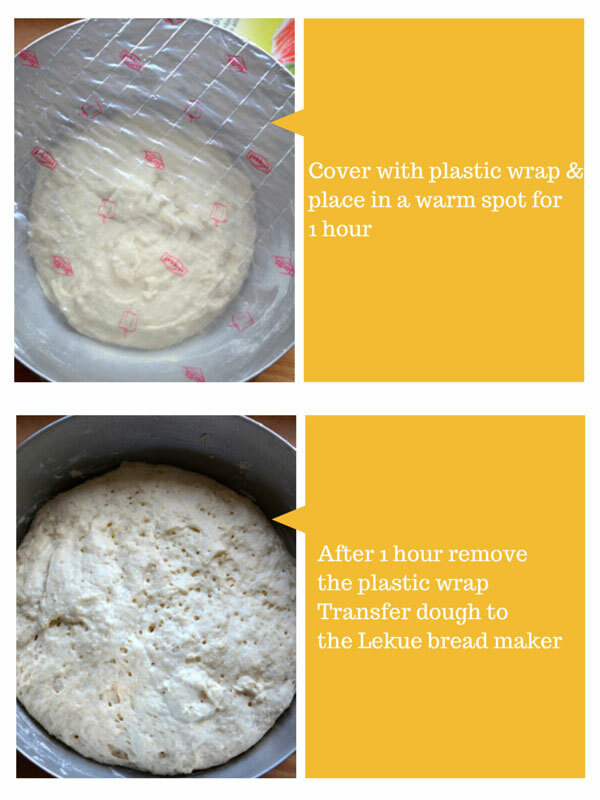 Lekue Bread Maker – I bake this gluten free bread in the Lekue Silicone Bread Maker There is no need for any extra flour, greasing or prying the bread out. The end result is a beautiful artisan bread with a nice crust. I love Lekue products! Their silicone is 100% BPA free dishwasher, freezer, microwave and oven safe. This loaf lasts a couple of days at room temperature. I usually slice up half of the loaf. Wrap each slice in plastic wrap or wax paper. Flash freeze the wrapped slices then place them in a freezer bag. When I need a slice I simply defrost one overnight in the fridge. Frozen slices can be warmed up in the oven or toaster as well. 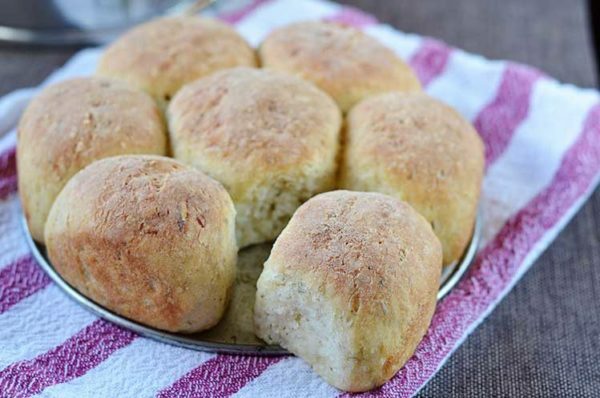 With a few adaptations you can also make dinner rolls. My original recipe uses Schar Mix B Flour. In North America I believe this flour mix is called Schar Naturally Gluten-Free Classic White Bread Mix . 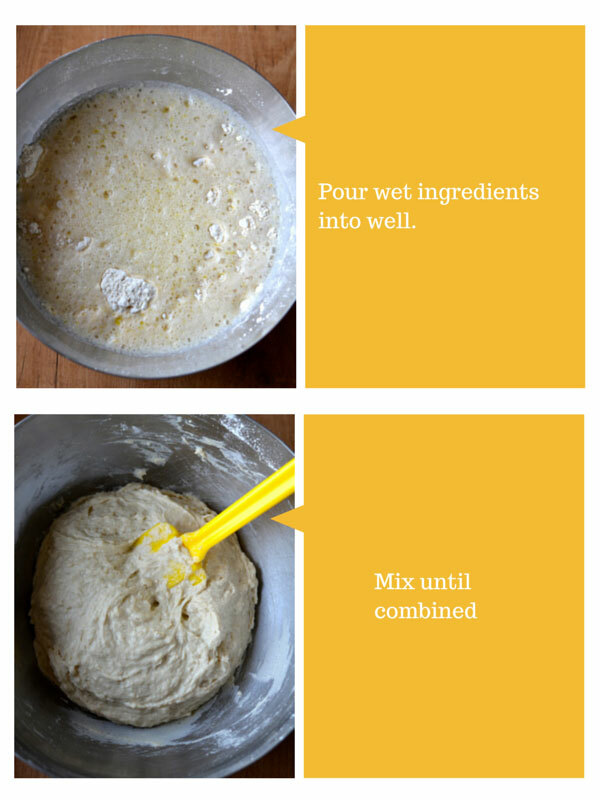 I get excellent results with this bread mix every time. 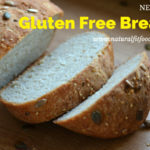 I suspected that other gluten free flour blends combined with my tips and tricks would also result in a great loaf of bread and luckily I was able to get my hands on Bob’s Red Mill 1to1 Gluten Free Flour and Dove’s Farm Gluten Free Flour . I have included the recipes using those flours in this post as well. If you do experiment with an alternative mix be sure to let me know how it turned out in the comment section. I finally got my hands on Bob’s Red Mill One to One Flour! 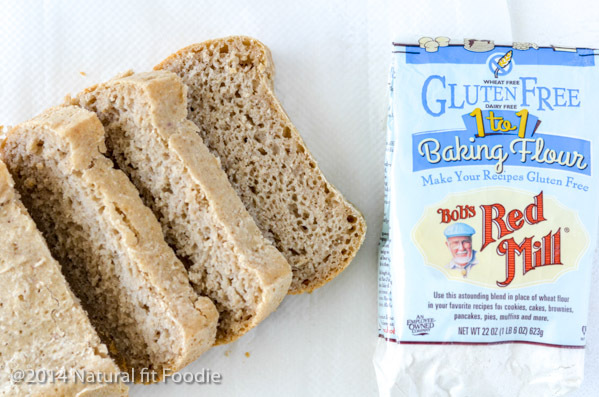 So many of you had written to me asking if this gluten free bread recipe works with Bob’s Red Mill One to One Flour that I just had to find a way to test it out. I ordered the flour through iHerb and had it delivered here to Spain so I could put it to the test. And now I can confidently report that YES it does! Overall I’m quite pleased with the end result of this gluten free loaf. I do find that the bread is a bit wet / gummy compared to the other loaves and I suspect it’s because the Bob’s Red Mill mix contains xanthan gum. For this reason I prefer this Gluten Free Bread with Bob’s Red Mill One to One Flour toasted. The recipe is basically the same as the original. The only change I made was to use 2 tablespoons psyllium husk. I spotted Doves Farm gluten free flour at my health shop the other day and couldn’t resist putting it to the test for my UK followers. I am truly impressed with this gluten free flour AND with the end result ! The recipe is basically the same as the original. The only change I made was to use 2 tablespoons psyllium husk. 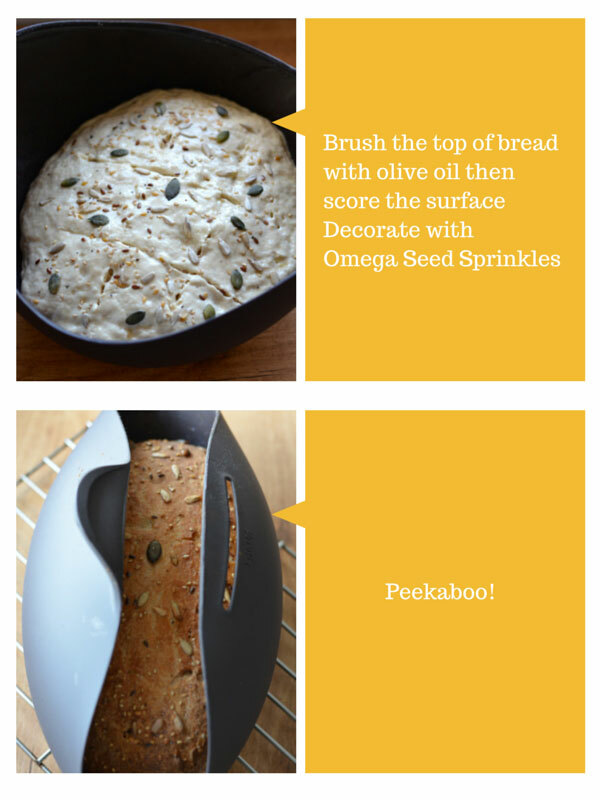 Don’t forget to Sprinkle Omega Seed Sprinkles onto the surface of the loaf with for a nutrition boost! Where do you buy Mix B from Schar? Hi Karin I am in Europe and get this at my local supermarket. In North America the mix is called Schar Naturally Gluten-Free Classic White Bread Mix. I’ve added an Amazon link in the most for it. Thanks! Thank you! I have to buy this mix when I visit Europe (my homeland). ARe there any other mixes that would work with this recipe? I don’t think I can find the Schar mix locally. That is the coolest bread pan ever! I really want it! Thanks Donielle! I love it as well. The crust is to die for! The idea of making my own bread kind of intimidates me, but this sounds pretty simple. I’ll have to give it a try! This looks yummy. I don’t have any gluten issues but I know some people who do, I will have to tell them about this recipe. Thank you for sharing Pamela! This looks super awesome! I am totally intrigued by that bread maker! Oooook girl. So I have made approximately 1,456 loaves of GF bread FLOPS. Like for real. This looks really good – I’m tempted LOL. What is the bread flour mix – I’m not familar with Schar? Also I do have a Cuisinart breadmaker with a GF setting – I might try it in there…we’ll see 😉 Thanks for the inspiration! The sparkling water is a neat idea! Hi Renee, I hear ya on the flops. The number of ‘bread like’ GF flops I have had to eat.. well I am not proud! This is the website for Schar US. http://www.schar.com/ I have a really limited selection of GF flours here in Spain. This one gives me the best result so far. You could probably substitute with another mix you like. I have heard good things about the Bob’s Red Mill brand. Looks great. I like your step-by-step directions. I have never seen a bread pan like this. I wonder if I can sub out the yeast for baking powder and baking soda. I can’t eat baker yeast. Hi Anna, the bread pan is awesome! I haven’t tried it but you can probably substitute the yeast for baking powder and baking soda. I would add a couple tablespoons of ACV to help with the rise. Oh this looks delicious! I haven’t had much success with gluten-free bread making … I really appreciate your recipe! It looks beautiful too! Thanks Megan! Buckwheat is one of my favourite GF flours! I’ve never tried Buckwheat flour so am excited to try it. Love the recipe and appreciate the step-by-step. Newbie or not.. Sometimes the pics just make it so much easier! Thanks! Now for that pan.. Thank you Carol. Buckwheat is really one of my favourite GF flours. I never liked white bread before going GF so I very often add buckwheat to baked goods for that whole grain feeling. Glad you liked the photos! 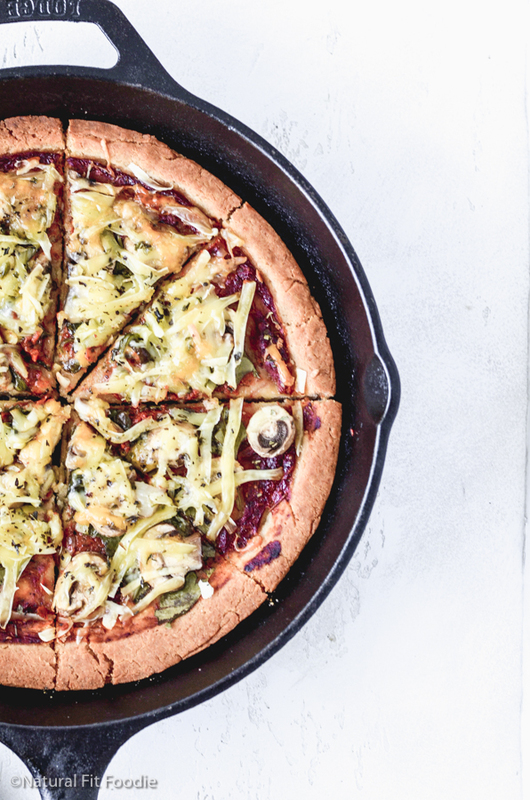 What a delicious recipe — I love the bread maker you baked it in as well. I’ve never seen one like that. How cool! I’m always looking for gluten-free recipes to make for my mom and sister. This bread looks fantastic! This looks sooo good! I need to get my hands on a bread maker. Thanks for sharing! This looks good…but doesn’t that bread mix contain all the things you said you don’t like to use in your bread? That kind of defeats the purpose of making bread from scratch, doesn’t it? Will this bread work without those added ingredients from the mix? I’m working on my own gf bread recipe. It’s not easy! Hi Mary thanks for your comment. I actually never said that I don’t like using any of those ingredients. The point I’m making is that combining those ingredients yourself is quite difficult and takes a lot of trial and error. I know because I am working on my own mix. I specifically wanted to keep this recipe simple especially for those new to GF bread making. By using a mix you can take a lot of the guess work out of it. For me this does not defeat the purpose of making the bread from scratch as I have yet to find a store bought GF loaf of bread that can even come close to this one and they contain 100 times more ingredients, one of which is usually eggs for which I have a slight intolerance. I agree, baking a bread like this from scratch takes some trial and error. However, I made very good experiences by building my own sourdough. After the 5th or so bread (3 weeks) the culture was very stable. All it took from there on was the sourdough culture, flour, a pinch of salt, a lot seeds (usually sunflower / flax / pumpkin) and little bit of extra yeast. The result was a typical heavy German style bread with with a thick crusty crust. Much better then anything commercial I could find around Montreal. Thanks Felix. Would you believe that just this week I started looking into making a gluten free sourdough starter! It always seemed so intimidating to me but it seems like you nailed it. Do you have an article or post I can refer to for help with that? I had this German book to get started: “Der Sauerteig – das unbekannte Wesen”. This probably doesn’t do you any good, so just take a bowl and add a 2 cups of water and a cup of flour (use some old grains for less gluten). Add new flour and a bit of water every 24h. You will get some bubbles on top and it will smell sour, this is what you want! If it smells shxxty, throw it out and try again. Yeast bacteria is almost everywhere and likes to grow in this environment, so usually it will all work out. Just remember to feed it every day (especially on hot days). After a couple of weeks the sour smell will intensify and you will need less added yeast for your bread. Depending on your feeding schedule you will have to use half of your culture for a new bread every 3 to 4 days. I totally understand. When I started gf baking I was a bit overwhelmed. I have never used a mix because of the odd ingredients. I’m getting close to a good gf bread from scratch that is egg free. That looks like it turned out really well! I have been craving bread for quite some time, I have to try this out. It’s so hard to find good healthy recipes, thank you so much for sharing! This looks so good! I haven’t had a piece of bread in over a month! Yes, I’m a newbie to the gluten~free life due to wheat allergy. It is very overwhelming to figure out this new diet, never mind the baking aspects! I truly appreciate this post. Pinned! Can this be nade without the beead machine and what would rhe kast step be? Hello Barbara, sorry I’m a bit confused by your question. What bread machine? The bread is baked in the oven in the silicone bread maker /pan. Yummmm!! Thanks for linking up, I can’t wait to see what you post next time! I pinned and tweeted this. What temp is this baked at? I couldnt find the info. Also, what about using a Lodge dutch oven or pot with a lid? I have heard of baking bread in them before, but not gluten free. Hello Tammy thanks for the heads up. The bread is baked at 200ºC/400ºF for 50 mins. I have not tried baking this bread in a dutch oven. If you do I’d be curious how it turned out. Hi Krystal, this looks great. Do you think this could be made in French loaf pan with holes in the bottom and a pan of water in the oven like one makes French baguettes? Trying to use what I have on hand. I made this bread. It didn’t turn out as fluffy as yours, but it’s still good and VERY filling. If I were to add some milk or let’s say a tbs of cream – would that make the batter too runny? It should add to the flavour. Hello Kat,you can surely try adding milk or cream, I have not. Adding more liquid means you will probably have to bake it a bit longer. Hi! Made this bread and it was really good! Just curious why it turned out so gray/brown (on the inside) compared to your loaf in the pictures above. Do you always use the buckwheat flour? Thanks for a great recipe! Hi Lina thanks for taking the time to comment and let me know you liked the bread! I’m really happy you enjoyed it. I alternate between buckwheat and oat flour. The buckwheat flour will give the bread that color. If you take a look at my buckwheat porridge you will see it has a grey/brown hue ? This recipe is great, could you help me with the dimensions for the pan, and does the bread rise in the oven or just when it’s resting. Oh ok! I’ll try it today , thanks a lot krystal!! Let me know how it goes Zehra! Hi, my bread doesn’t rise all that much. How long should I proof it? And at what temperature? And when I put in the oven it collapses. Help!! Hi Zehra. One hour in a room temperature/warm spot should be enough time for the bread to proof. Over rising is what would usually cause a bread to collapse but if you say it doesn’t rise much then I’m stumped. Are you following the recipe exactly or have you made some substitutions? Yes , I’m following the recipe , maybe it’s the yeast, I’m using instant yeast 3×11g, does that make sense ? We don’t have a lot of options here in pakistan as far as gluten free is concerned. I’m adamant to get it right! Why so much yeast Zehra? The recipe calls for one packet 5.5g which is approx 2 teaspoons. I am really happy to have found this recipe, thank you for sharing! Hello Sofia! I’m so happy to hear that you’re enjoying the bread. 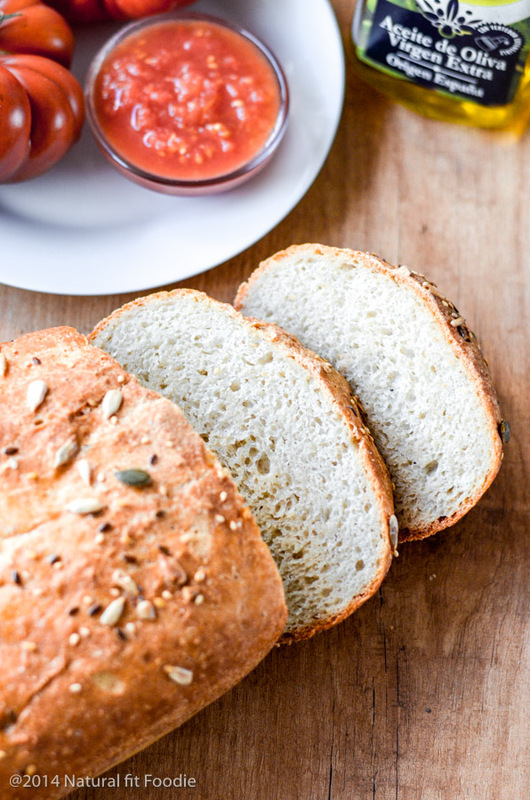 Are you using the Schar bread flour or another? Thank you for putting up this very simple Newbie Bread recipe. For the first time in over 40 years of trying to make bread, this is the first time I have been completely and surprised at the perfect loaf I got out of the oven yesterday. No knead bread suits me as kneading gave me painful ganglions in my wrists. For me a real secret was using carbonated water and a little psyllium flakes. I substituted Barley four instead of buckwheat flour (unobtainable where I live) and for us ‘Down Under’ folk I used Edmonds Gluten Free flour which people in New Zealand (definitely) and Australia should be able to obtain. Thank you particularly for including metric and kitchen cup and spoon measurement s; and for putting in the metric value for the oven temperature. USA is about the last country on earth still using the imperial system. It is such a pain to read an American recipe and have to work out comparable metric values, but you had it all. By the way I had no gullet ache when I was eating (with Berry Chia Jam). Bless you. Congrats! I’m elated that the recipe worked well for you. I’m going to update the post to include the Edmonds flour as an alternative that works. 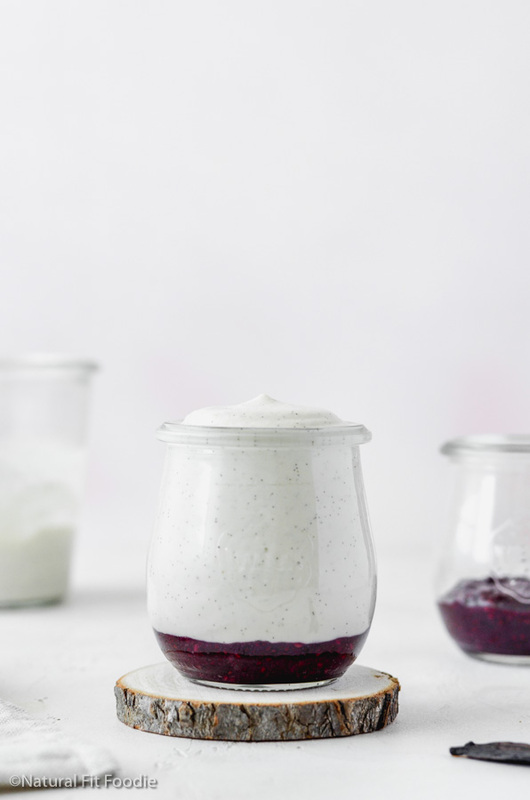 In place of buckwheat you could also try oat flour, teff or sorghum since barley flour isn’t gluten free.Berry Chia jam is a fine choice for this yummy bread! Buck wheat four and psysillium husks are available from Binn Inn in NZ. After waiting patiently for my Lekue baking mold to arrive, l was finally able to make this bread yesterday using the recommended Schar Bread Mix B and buckwheat flours. The result was a perfectly shaped, tender bread with a beautiful crust. No one could tell it was gluten free! You are awesome for sharing this with us. Thank you!!! Rebecca this makes me soooooo happy to hear this! Are you in the US? Where did you find the Schar Bread Mix? Krystal, I also thank you for including metric weights as the cup measurements are almost impossible to get exact and I don’t have a set of US cups! I look forward to trying this once I get my Lekue and I will let you know how it goes. One question, I am in Ireland and I have the Doves Farm Plain white flour so, can you please confirm that I have understood correctly that I should use 2 tablespoons of whole psyllium husks when using Doves Farm flour? Thanks again. Hello Mary. Thank you for taking the time to leave a comment. The Doves Farm Flour does not contain any binders in the mix so yes you should use 2 tablespoons of psyllium husks. Once you’ve made the bread I would love if you’d come back to share your experience with us and leave a rating on the recipe. Good luck! With Bob’s Red Mill 1 to 1, this recipe was looking too dry. 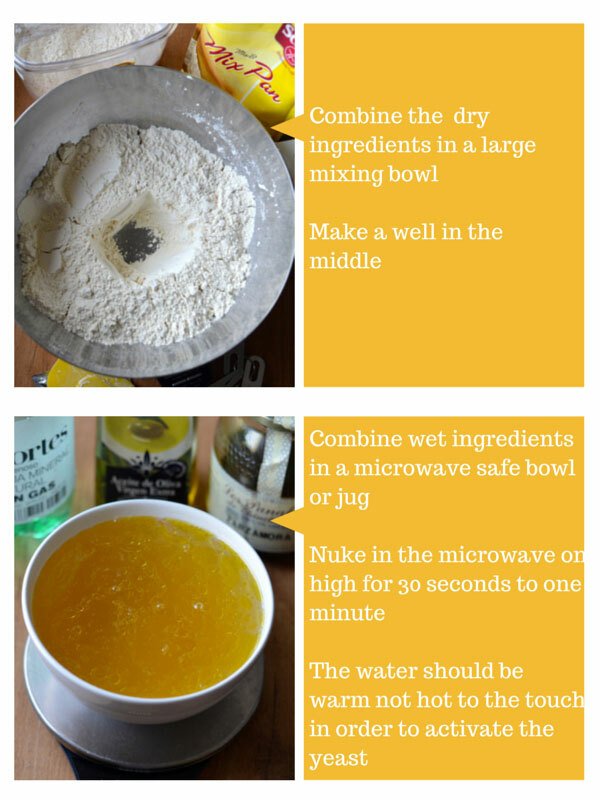 We added 1/2 cup sparkling water to make the dough look like it does in the picture. It has risen beautifully, and is now in the oven. 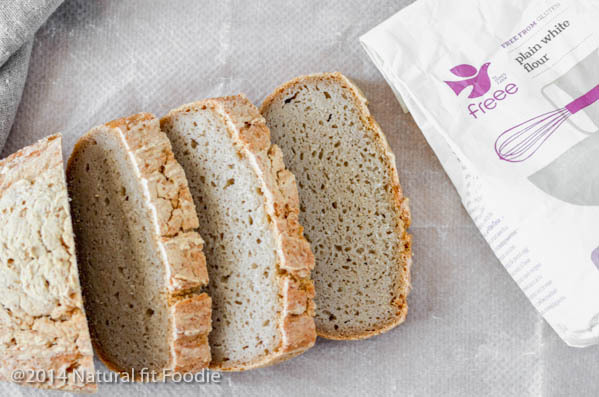 Thank you Johanna for you feedback using Bob’s Red Mill 1 to 1 to make this Easy Newbie Gluten Free Bread. Please let me know the end result! Is there any way to make this without yeast? I know it’s a tall order but I trust that with ur expertise even this would be possible. Hi Sophie, I haven’t tried this gluten free bread recipe without yeast. If you don’t have issues with eggs you can try adding one because without the yeast I’m afraid that this bread would not rise much at all. Also maybe adding a tablespoon of baking powder might work in place of the yeast. If you give it a try please come back and let us know how it turned out. Hi, I made this recipe using Edmonds gluten free flour but added an egg to improve the texture. I sprinkled the top with sunflower seeds as well. I used Edmonds Active all purpose yeast as it is gluten free. I kick started it in about half cup of water plus a little sugar and it frothed up very quickly more so than the usual Edmonds surebake yeast that I bake my gluten breads with. I rise all my breads in the oven at the lowest setting 30c and in less than an hour it had nearly doubled. The cooking time of 50 minutes seemed to be good and the bread was beautifully browned, rose well and a very light open texture. My daughter who recently found she was gluten intolerant was exited that I made bread for her as she hadn’t had bread for a some time. The bread went down a treat with all the family and it surpassed my expectations compared to the range of gluten breads I bake bread every Saturday morning. Thanks Krystal for an awesome recipe !! !